What do you see when you look at that picture. Many people around the world see a murder or terrorist. Many people see this picture and dream about his death and look forward to his execution. Too many people see someone they hate. Who do you see? 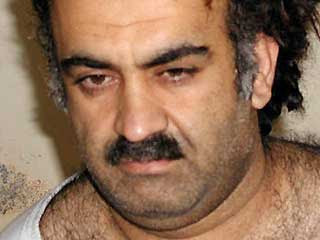 Not sure, let me tell you who this man is, I read about it in an news story from today on Fox News… His name is Khalid Sheikh Mohammed…Let me give you one quote that will shape your opinion quickly of him, this is what he said in a courtroom last March (2006), “I was responsible for the 9/11 operation from A to Z," Mohammed said in a statement read during the session, according to hearing transcripts later released by the Pentagon. Anything change yet? How do you feel now? My immediate emotional response to seeing his picture, seeing the picture of the man who is claiming responsibility for the event that changed America forever, seeing the picture of a man who is responsible for taking thousands of innocent lives, seeing the picture of a man who boast in his accomplishment that he feels was his definitive religious act of obedience, was not what I expected it to be. Obviously my stomach turned in knots because it is always weird to see the face so many Americans feel victim too, but my heart sank deep in my chest, and my eyes teared up, I felt so sorry for this man, in this brief moment I felt like I could see Him with Jesus’ eyes. I’m sure I say or feel something totally selfish later because, well, that is the way we are, humanity is just messed up with sin, but in that one moment I felt like I was feeling what God felt. I felt pain for Him. He doesn’t know Christ. He thinks he is serving God, but serves a religion where he must prove himself over and over again until he finally has to give his life and take others along the way, he is hated, he is an outcast or our society and will go down in the books as something instead of someone. The something he will be is the master mind behind 09/11 instead of a someone created in God’s image. I’m kind of taken back right now. I actually don’t hate him, I feel a deep sorrow for him and his family because he is far from God and doesn’t even know and now, more so than ever, he will be surrounded by more hate than love and love is what he needs. Love your enemy has never echoed in my heart so loud before, it has never been this real. So take a minute and look again, what do you see? This is some kind of sick optical illusion isn’t it, it appears to be a scum bag terrorist who kills innocent people and believes in a outrageous religion, but it is really a man created in God’s image far removed in need of Him.